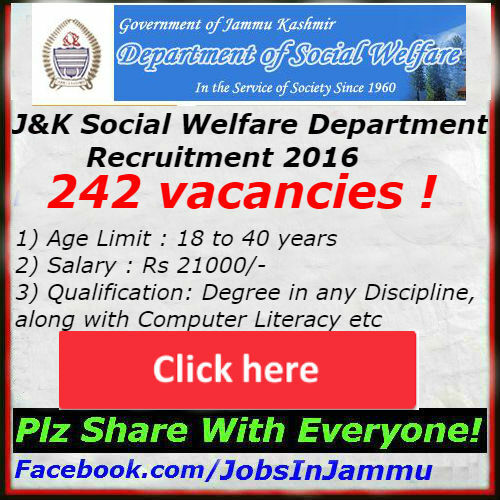 Today, we are going to share the Details of vacancies advertised by the Department of Social Welfare J&K. These are district level posts and appointed will be posted in the specified district only. J&K's Social Welfare Department is one of the Best workplaces in J&K. These vacancies in the Social Welfare Department are advertised via Advt. Notification No. 1 of 2015 Dated 2nd May, 2015. These vacancies are advertised in the Leading Newspaper of J&K including Daily Excelsior. The Maximum Qualification specified for these posts is only 10+2. So any one who had completed His/Her intermediate can apply for Permanent Jobs in J&K's Social Welfare Department.